A historic building in downtown Bemidji is getting attention not because of its past, but as a robust symbol of the future. Once a grocery warehouse, the century-old Mayflower building is enjoying new life as a high-tech business accelerator, following an inspired renovation and redevelopment effort led by Greater Bemidji. Greater Bemidji bought the building in November 2014 with funding from the City of Bemidji, Beltrami County, the Neilson Foundation, the Blandin Foundation and other area organizations. 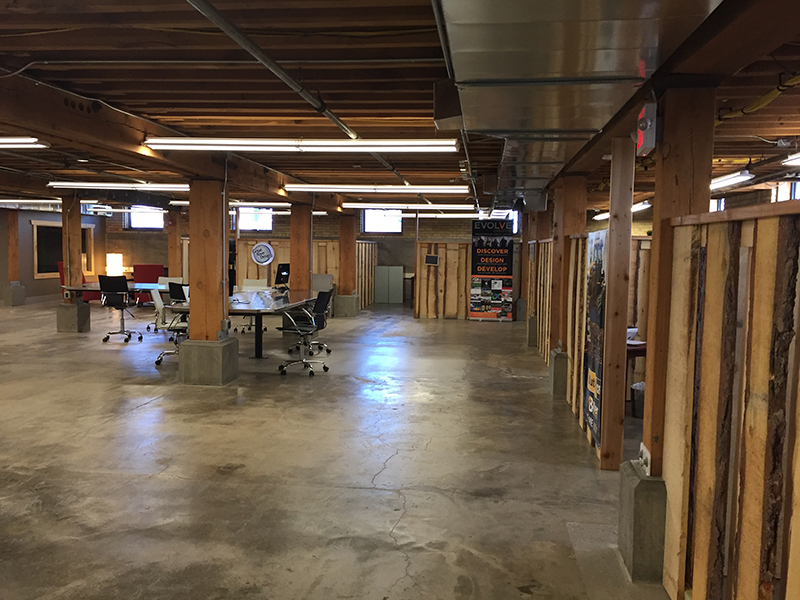 Following $1.6 million in renovations and much planning, the Mayflower is now attracting state of the art technology and engineering companies, and has become an entrepreneurial incubator for new business. Mayflower occupants include the product design department of machine part manufacturer TEAM Industries; software/programming company EXB Solutions, Greater Bemidji and rotating departments of Bemidji State University, including the internship program and the Marketing Assistance and Research Solutions program. Designed by Lucachick Architecture, the renovated building centerpiece is “The LaunchPad,” a central atrium co-working space for entrepreneurs, freelancers, start-ups and professionals, with amenities including a video wall for presentations. The building is a showcase for the Business IT services of Paul Bunyan Communications, provider of the Mayflower’s tech wall, high speed internet, building security features and remote control functions. To encourage synergy and discussion in the entrepreneurial tech community, The LaunchPad hosts weekly idea exchanges with local entrepreneurs; and a program called Office Hours, connecting retired CEO’s with young businesspeople looking to learn. The Mayflower’s history is entwined with Kraus-Anderson. The two-story, 13,464 s.f. building was originally built in 1901 as a grocery warehouse for the Nash Finch Company. KA purchased the building in 1986, upgrading its infrastructure at that time to serve restaurants and specialty retail; and later, other tenants including a charter high school. Eventually the building became part of a multi-building mixed-used complex managed by Kraus-Anderson Realty and including tenant Kraus-Anderson Construction Company’s Bemidji operations. Greater Bemidji approached KA about purchasing the building in 2014, completing the purchase late that year; and KA jumped in to perform the renovations. 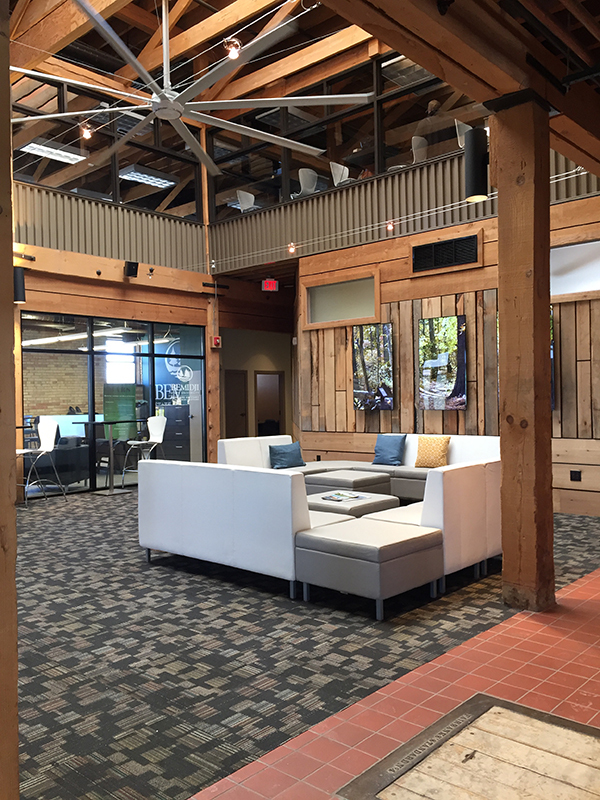 Renovation of the first and second level were completed in May of 2015, when Greater Bemidji moved in, along with tech firms TEAM Industries and EXB Solutions as primary tenants. In April of 2017, KA completed renovation of the lower level for tenant use. KA Realty continues as property manager for the building, which is now considered a business accelerator for downtown Bemidji, creating high –paying manufacturing jobs.